Part of being a photographer in the 21st century means that you're going to get clients that are going to want to post, share or otherwise publish the work you create for them. So how do you make sure that wherever they post those images online, you get your due credit by way of a short line in the caption? Well go ahead and read on for one of my favourite methods. Chances are you put something to a similar extent into your service contracts, something along those lines that states your clients are requested to include information about you, the creator. But, we all, or at least some of us know how well that works. We're don't have time to be the caption-police, and may not even have our clients linked through our Facebook accounts, so what is the work around? It's so easy you're going to love it. Since most people post their photos to Facebook, I'll focus on that, but this method works for most other social media sites. Whenever I am ready to deliver a selection of photos to a client, my last step (after making sure it all looks beautiful) is filling out the file descriptions and captions. Facebook strips almost all the data from images when you upload them, including your copyright tags - but the one thing they do keep is the caption / title fields. And those caption/title fields actually become the image caption on the Facebook page. When it comes to writing captions for clients, I like to report the news - just stick to the facts. Mine would usually read something like "Steph and Chris' Wedding Photos captured by Chris Gardiner Photography on September 12, 2015 in Anytown, Ontario. www.cgardiner.ca". It has got your who, your why, the when and the where. Now, every photo they upload is going to have the captions pre-filled for them which they may even thank you for! It's not likely that your clients don't want you to have the photo credit, it's just maybe they couldn't always be bothered to fill it out - we're all busy people after all. Making it easy on your photography clients with this method really can't hurt. 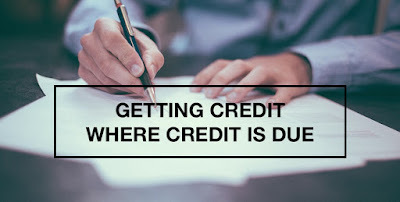 As a side note, this isn't just handy for making sure you get your due credit on your client's social media pages, but if you upload to your own Facebook, or flickr, or wherever, it can save you a lot of typing. Plus it's easier to batch one caption to 100 files in Adobe Lightroom or Adobe Bridge than it is to do it to the same 100 photos after they've been uploaded to most social media websites. We don't get typically get paid hourly when we work for ourselves, so the more efficient you can be with your work time - the more time you'll have for all of the other important things in your life. And speaking of photo credit ; the title photo for this post is under CC0, the Public Domain and was obtained from Unsplash.